"Evergreen State" redirects here. For the state with that nickname (in which this college is located), see Washington (state). "Evergreen College" redirects here. For the college in Canada, see Evergreen College (Canada). 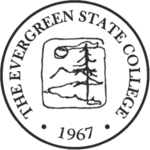 The Evergreen State College is a public liberal arts college in Olympia, Washington. Founded in 1967, Evergreen offers a non-traditional undergraduate curriculum in which students design their own paths of study. Full-time students enroll in interdisciplinary academic programs instead of classes. Programs typically offer students the opportunity to study several disciplines in a coordinated manner. Faculty write narrative evaluations of students' work in place of issuing grades. Evergreen's main campus spans 1,000 acres of forest bordering the southernmost waters of Puget Sound, and it also has a satellite campus in nearby Tacoma. The school offers a Bachelor of Arts in Liberal Arts and Bachelor of Science, Master of Environmental Studies, Master in Teaching, Master of Public Administration, and Master of Public Administration in Tribal Governance. As of 2018, there were 3,327 students, 3,018 of whom were undergraduates, and 223 faculty. In 1964, a report was issued by the Council of Presidents of Washington State baccalaureate institutions stating that another college was needed in the state to balance the geographical distribution of the existing state institutions. This report spurred the 1965 Washington legislature to create the Temporary Advisory Council on Public Higher Education to study the need and possible location for a new state college. In 1965–66, the Temporary Advisory Council on Public Higher Education (assisted by Nelson Associates of New York) concluded "at the earliest possible time a new college should be authorized", to be located at a suburban site in Thurston County within a radius of approximately 10 miles (16 km) from Olympia. Evergreen's enabling legislation – HB 596 (Chapter 47, Laws of 1967) – stated that the campus should be no smaller than 600 acres (240 ha), making it then the largest campus in the state as well as the first public four-year college created in Washington in the 20th century. On January 24, 1968, The Evergreen State College was selected from 31 choices as the name of the new institution. On November 1, 1968, Charles J. McCann assumed the first presidency of the college. McCann and the founding faculty held the first day of classes October 4, 1971 with 1128 students. McCann served from 1968 until stepping down to join the faculty June 6, 1977 when former Governor Daniel J. Evans, who signed the legislation creating Evergreen, assumed the presidency. Evans left the president's office in 1983 when he was appointed to the United States Senate to fill the vacancy created by the death of Senator Henry M. Jackson. The largest building on campus is named in honor of Evans, the Daniel J. Evans Library Building. The entrance to the campus bears McCann's name, the Charles J. McCann plaza. In the 1992-93 school year, students chose Leonard Peltier to give the address at commencement, which was the first with a graduating class of more than 1,000. The selection was described as "perhaps the most unconventional commencement speaker" in a published round-up of the most controversial graduation speakers on campuses nationwide that year. Peltier, who was in federal prison, submitted his remarks in writing, to be read by a graduating senior. In 1999, Mumia Abu-Jamal was invited to deliver the keynote address by audiotape for the graduating class at the college. The event was protested by some. In 2004, the college completed the 170,000-square-foot (16,000 m2) Seminar II building, and a significant remodel of the Daniel J. Evans Library was completed. In 2015, George Sumner Bridges became the sixth president of Evergreen State College, not counting interim appointments. Bridges had previously served as president of Whitman College in Walla Walla, WA. He followed Thomas L. “Les” Purce (2000–2015), Jane L. Jervis (1992–2000), and Joseph D. Olander (1985–1990). Every April since the 1970s until 2018, Evergreen has held a daylong event called Day of Absence, inspired by the Douglas Turner Ward play of the same name, during which minority students and faculty members voluntarily stay off campus to raise awareness of the contributions of minorities and to discuss racial and campus issues. As of 2017[update], approximately 25% of Evergreen students were racial minorities. Since 1992, the Day of Absence has been followed by the Day of Presence, when the campus community reunites. In 2017, the Day of Absence was altered after students of color voiced concerns about feeling unwelcome on campus following the 2016 U.S. Presidential election. For that year's event, white students, staff, and faculty were invited to stay off campus. Events for students of color were held on the Evergreen campus. Bret Weinstein, a professor of biology at Evergreen, wrote a letter in March to Evergreen faculty explaining his objections to the change in format: "On a college campus, one’s right to speak — or to be — must never be based on skin color." and "There is a huge difference between a group or coalition deciding to voluntarily absent themselves from a shared space to highlight their vital and under-appreciated roles [...] and a group or coalition encouraging another group to go away." Weinstein's emails were leaked and widely shared among conservative media outlets such as Breitbart and Heat Street, which led to harassment and threats towards school officials. In late May 2017, student protests—focused in part on the comments by Weinstein—disrupted the campus and called for a number of changes to the college. Weinstein says he was told that campus police could not protect him and that they encouraged him not to be on campus, which caused Weinstein to hold his biology class in a public park. Weinstein and his wife, Professor Heather Heying, later resigned and reached a $500,000 settlement with the university after having sued it for failing to "protect its employees from repeated provocative and corrosive verbal and written hostility based on race, as well as threats of physical violence". A June 1 direct threat to campus safety led to an evacuation and two-day closure of the campus. Vandals with sticks and baseball bats caused approximately $10,000 in damage to the campus and forced closure of the school for an additional day. A June 15 protest on campus by the far-right group Patriot Prayer led to campus being closed early. The following day, Evergreen's 2017 commencement ceremony was also moved off-campus because of safety concerns. A report from the college suggested that the protests may adversely affect Evergreen's enrollment, which has been declining over the last decade. Consequently, the college cut its budget by 10% and increased student fees. Evergreen is unique in that undergraduate students select one 16-credit program for the entire quarter rather than multiple courses. Full-time programs will encompass a quarter's worth of work in everything related to that program concentration, by up to three professors. There are no "majors": students have the freedom to choose what program to enroll in each quarter for the entire duration of their undergraduate education, and are never required to follow a specific set of programs. Evergreen is on the "quarter" system, with programs lasting one, two, or three quarters. Three quarter programs are generally September through June. At the end of the program the professor writes a one-page report ("Evaluation") about the student's activity in the class rather than a letter grade, and has an end-of-program evaluation conference with each student. The professor also determines how many credits should be awarded to the student, and students can lose credit. In order to obtain a Bachelor of Arts, a student must complete 180 credits. In order to obtain a Bachelor of Science, a student must complete 180 credits, 72 of which need to be in science, with 48 of those noted as upper division. This requirement can be satisfied by one year of upper-division science. Evergreen's Evening and Weekend Studies Program makes it possible for students who cannot attend full-time, day classes to get a Bachelor of Arts degree by attending on a part-time basis through night and weekend interdisciplinary programs. According to U.S. News & World Report's 2018 college rankings, Evergreen is ranked #33 in Regional Universities West, and #1 in Regional West Best Undergraduate Teaching. US News ranked Evergreen as #33 in the nation for offering first-year experiences to freshmen, which entails building into the curriculum first-year seminars or other programs that bring small groups of students together with faculty and staff on a regular basis. Author and former education editor for The New York Times Loren Pope cites Evergreen as one of two public colleges in the United States in his book Colleges That Change Lives. The Evergreen State College has an admission rate of 97%. 360° panorama on the campus of The Evergreen State College in Olympia, Washington. This panorama features the Daniel J. Evans Library and the clock tower set in a brick courtyard lined with trees. 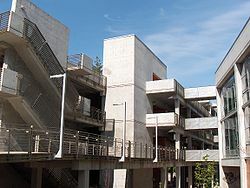 The main library on The Evergreen State College campus is the Daniel J. Evans Library, named after the former governor who signed the legislation that founded Evergreen, and was also the school's second president. The library is home to some 428,000 volumes and 750,000 print and media items overall. The library hosts a number of small viewing rooms and also maintains special collections of rare books, archival material, and government documents. The Quantitative and Symbolic Reasoning Center (QuaSR), a tutoring center for the sciences, is located on the first floor of the library. The library is located in the Information Technology wing of the Daniel J. Evans Library Building. This wing is also the home for Media Services and a large Academic Computing center. The Evergreen State College has 1,000 acres (400 ha) of land that is mostly second growth forest. The entire campus serves as a natural laboratory for scientific field research and provides inspiration for creative work. Throughout the 1,000-acre (400 ha) forest there are multiple trails leading to a variety of locations throughout the reserve and to Evergreen Beach. The coastal habitat is characterized by steep bluffs, gravelly beaches with many washed-up logs, and the marine intertidal zone which extends up to 150 feet (46 m) out into Puget Sound's Eld Inlet during low tides. Evergreen has approximately 3,300 feet (1.0 km) of untouched beach and11 hectares (27 acres) of southern Puget Sound tidelands. . Students use the beach and tidelands for scientific study and as a place to get away from their studies and relax. There are multiple trails leading to the beach and a small road that leads to the only building at the beach and small boat ramp. The bluffs range from 15 to 60 feet (5 to 20 m) in height. The Evergreen Organic Farm annual crop bed space comprises 38,000 square feet (0.35 ha), slightly less than 1 acre (0.40 ha). The farm also produces apples and other perennial food crops, and tends to a flock of hens. Produce is sold to the Evergreen community through CSA (Community Supported Agriculture) shares, or from a farm-stand on Red Square every Tuesday and Thursday from 11am to 5pm during the growing season. Produce is sometimes sold to campus food services Aramark and the Flaming Eggplant Cafe. Excess produce is available to students in the interdisciplinary program, titled "The Practice of Sustainable Agriculture". Proceeds from the sale of the crops are used to finance farm projects, as well as purchase seeds and equipment. Two of the greenhouses, the cooler, compost shed, farm fencing and orchard are just a few projects made possible from farm sales. Another use for money generated on the farm is to fund student projects. Many of these projects are related to horticultural aspects of food crops. The farm production area is divided into sections that are used to delineate cropping areas for specific types of crops. The farm practices a strict five year crop rotation. The rotating of crops creates plant diversity over time as opposed to plant diversity in space. The rotation has four general crop categories with each category occupying a given space for one growing season. Crop rotation is just one method the farm uses to maintain diversity in the field. Other methods employed are the use of undersown ground covers and inter-cropping different types of vegetable crops. Creating diversity in the field is one of the cornerstones of sustainable agriculture. Diversity provides non-toxic, sustainable crop protection against plant diseases and insect pests. The Evergreen Organic Farm hosts a large composting facility that composts all compostables from the campus. It also hosts a Biodiesel facility, a community garden, demeters garden, and a large farmhouse that was partially built by students. The Evergreen State College is the home of the Longhouse Education and Cultural Center. The Longhouse exists to provide service and hospitality to students, the college, and surrounding Native communities. With a design based on the Northwest Indigenous Nations' philosophy of hospitality, its primary functions are to provide a gathering place for hosting cultural ceremonies, classes, conferences, performances, art exhibits and community events. The Longhouse provides the opportunity to build a bridge of understanding between the regions' tribes and visitors of all cultures. The public service mission of the Longhouse is to promote indigenous arts and cultures through education, cultural preservation, and economic development. It is also the administrative home for the Washington State Institute for Public Policy. The Institute's mission is to carry out practical, non-partisan research—at legislative direction—on issues of importance to Washington State. The Institute conducts research using its own policy analysts and economists, specialists from universities, and consultants. Institute staff work closely with legislators, legislative and state agency staff, and experts in the field to ensure that studies answer relevant policy questions. Evergreen teams, nicknamed athletically as the Geoducks, are part of the National Association of Intercollegiate Athletics (NAIA), primarily competing in the Cascade Collegiate Conference (CCC). Men's sports include basketball, cross country, soccer, crew, and track & field; while women's sports include basketball, cross country, soccer, crew, track & field and volleyball. A geoduck is a clam native to the region. Former men's soccer star Joey Gjertsen, who led the Geoducks to the 2004 NAIA National quarterfinals, has gone on to have professional success with the San Jose Earthquakes of Major League Soccer. Shawn Medved previously had success in the MLS, playing for D.C. United and the San Jose Clash. Medved scored the tying goal in the 1996 MLS Cup as D.C. went on to the championship. Evergreen also had a strong run in men's basketball during the first decade of the 21st Century, winning the 2002 Cascade Collegiate Conference championship and reaching the NAIA national tournament in '02, '09 and '10. Forward Mike Parker from the '02 team has become one of the top professional players in Japan and several other basketball players have gone on to professional careers overseas. Student media include The Cooper Point Journal (Student-run newspaper) and KAOS-FM (Evergreen's community radio station). Among notable alumni are mycologist Paul Stamets; cartoonists Matt Groening, Craig Bartlett, and Lynda Barry; comedians Josh Blue and Michael Richards; musicians Macklemore, Carrie Brownstein, Corin Tucker, Kathleen Hanna, Tobi Vail, Conrad Keely, Tay Zonday, John Wozniak, and Martin Courtney; reality television star Steve Thomas; writers Benjamin Hoff, Judith Moore, Tom Maddox and Wendy C. Ortiz; Lynda.com founder Lynda Weinman; activist and diarist Rachel Corrie; professional soccer players Shawn Medved and Joey Gjertsen; and United States Representative for Washington's 10th congressional district Dennis Heck. ^ "Master of Public Administration in Tribal Governance". The Evergreen State College. ^ "Evergreen Fact Page". The Evergreen State College. Retrieved 12 November 2018. ^ Rosenzweig, Joy (November 6, 1997). "The Innovative Colleges and Universities of the 1960s and 1970s: What Keeps the Dreams of Experimentation Alive?" (PDF). Annual Meeting of the Association for the Study of Higher Education (22nd, Albuquerque, NM, November 6-9, 1997). Retrieved 20 November 2018. ^ Vallance, Karla (February 17, 1983). "Evergreen: Can a college of the '60s survive '80s?". Christian Science Monitor. Retrieved 20 November 2018. ^ Booth, William (28 February 2000). "On Calif. Campus, an Experimental Era Nears Its End". The Washington Post. Retrieved 20 November 2018. ^ Clabaugh, Earl. "Dean" (PDF). Retrieved 29 April 2014. ^ "Graduation Weekend Preview" (PDF). Greener Scene: The Newsletter of The Evergreen State College. Office of College Relations. May 14, 1993. Retrieved 15 November 2018. ^ Shea, Christopher (19 May 1993). "Controversial Commencement Speakers". The Chronicle of Higher Education. Retrieved 15 November 2018. ^ "Commencement Programs 1972-2014". Evergreen State College Archives. The Evergreen State College. Retrieved 15 November 2018. ^ "Mumia Abu-Jamal to Speak at College Graduation Ceremonies" (Press release). Peter Bohmer of Evergreen State College, Washington. May 26, 1999. Retrieved 2008-01-22. ^ "Past Presidents". The Evergreen State College. Retrieved 12 November 2018. ^ a b c "Day of Absence & Day of Presence", First Peoples Advising Services, Evergreen State College. Retrieved June 3, 2017. ^ a b c Jaschik, Scott. (May 30, 2017). "Who Defines What Is Racist? ", Inside Higher Ed. Retrieved June 3, 2017. ^ a b Svrluga, Susan; Heim, Joe (June 1, 2017). "Threat shuts down college embroiled in racial dispute". Washington Post. ^ Manchester, Chloe (April 10, 2017). "Day of Absence Changes Form". The Cooper Point Journal. Retrieved June 27, 2017. ^ "Long-simmering discord led to The Evergreen State College's viral moment". The Seattle Times. 2017-06-10. Retrieved 2017-09-15. ^ "Day of Absence Changes Form", Cooper Point Journal, Evergreen State College. Retrieved June 15, 2017. ^ Volokh, Eugene (2017-05-26). "Opinion | 'Professor told he's not safe on campus after college protests' at Evergreen State College (Washington)". Washington Post. ISSN 0190-8286. Retrieved 2018-03-22. ^ Knauf, Ana Sofia (June 14, 2017). ""Go Back to the Zoo": How Evergreen State College Became a Target For Right-Wing Trolls". The Stranger. Retrieved July 21, 2018. ^ Richardson, Bradford (May 25, 2017). "Students berate professor who refused to participate in no-whites 'Day of Absence'", The Washington Times. Retrieved June 3, 2017. ^ Weinstein, Bret (30 May 2017). "The Campus Mob Came for Me—and You, Professor, Could Be Next" – via www.wsj.com. ^ "Professor told he's not safe on campus after college protests". ^ "Evergreen settles with Weinstein, professor at the center of campus protests". The Olympian. Retrieved 2018-11-11. ^ Svrluga, Susan & Heim, Joe. (June 1, 2017). "Threat shuts down college embroiled in racial dispute", The Washington Post. Retrieved June 3, 2017. ^ Svrluga, Susan (5 June 2017). "Evergreen State College reopens after violent threat and property damage on campus" – via www.washingtonpost.com. ^ "Counter-protesters clash with pro-Trump group Patriot Prayer at Evergreen State College". The Seattle Times. 2017-06-15. Retrieved 2017-09-15. ^ "Right-Wing Slugger "Tiny" Toese Arrested Again While Trolling Portland". Willamette Week. Retrieved 2017-12-11. ^ Pemberton, Lisa (2017-06-06). "Safety concerns prompt Evergreen to move commencement ceremony". The Olympian. Retrieved 2018-11-11. ^ a b Spegman, Abby (May 11, 2018). "Evergreen looks to cut $6 million from its budget, raise fees due to enrollment drop". The Olympian. Retrieved July 21, 2018. ^ Pope, Loren (2006). Colleges That Change Lives (3rd ed.). Penguin. ^ "Best Colleges – First-Year Experiences". ^ a b "Campus Master Plan: Volume II – Goals and Policies for Land Use" (PDF). The Evergreen State College. January 2008. ^ "Cooper Point Journal". Retrieved 17 February 2017. ^ "KAOS Community Radio – 89.3 FM Olympia". Retrieved 17 February 2017. Sevcik, Rita; Stilson, Randy (1995). "Rita's Archival Page: The Evergreen State College – Planning Milestones and Early Years". Evergreen State College. This page was last edited on 13 April 2019, at 14:52 (UTC).